Uniden corporation is a Japanese company with a large presence in America. They are producers of a wide range of video surveillance systems aimed at bolstering security for both home and offices. They are producers of the Guardian range of wired security camera systems as well as WIFI cameras and wireless security systems. The Uniden security cameras cut across a wide range of functions to fit different security needs. 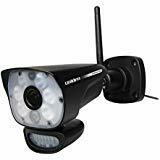 This review cuts across some of the latest Uniden security cameras, their specification and pros and cons. 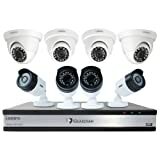 The Guardian G71644D3 Wired Video Surveillance System is a complete video surveillance system by Uniden. It boasts an array of features to make a great tool for home and office surveillance. Motion detection and mobile alert functions available. 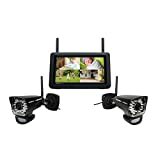 The Uniden UDR744HD is a video surveillance system comprising of a 7inch HD touch screen display and 2 outdoor cameras. This surveillance system finds use in homes and small businesses where there isn’t need for too many cameras. Installation of the Uniden UDR7444HD is easy as it doesn’t require any professional installation. Remote access on mobile devices both iOS and android and alerts. Installation is easy. Set up is DIY and takes less than 15 minutes typically. Sub-optimal night vision of 40 ft.
For the third ‘best of’ Uniden choice, we suggest the ULC58 ‘LightCam’. This is a outdoor camera by Uniden that functions differently from the already reviewed security cameras unit. The ULC58 functions as both a spotlight with its built it LED lights and a security camera. The night vision feature provides clear video up to 45 feet. The ULC58 is compatible with the UDR780 security kit. Accessible via the free mobile app, available on both Android and IOS. Requires the UDR780 security kit for full function. The Uniden AppCam 26PT is a different type of WIFI camera that is intended for indoor use. The camera offers a pan tilt and zoom functionality and also offers HD Quality video. While the AppCam might support memory card storage up to 32GB, there is none included in the box so users have to purchase that separately. It comes with a built-in microphone and provides night vision up to 20 ft.
With the free AppCam app, you can remotely access video feeds and take snapshots while recording. Specification seems obsolete as more cameras are available with better spec. Night vision is suboptimal @ 20 ft. The Uniden UDS65 camera system is similar to the UD780 in that it offers a 7-inch capacitance display and 2 cameras out of the box, where they differ is that the UDS65 is a rechargeable camera system that offers up to 3.5 hours of battery use and 8GB SD card that offers up to 40 hours of recording. Night vision up to 40 ft.
Night vision can be better. Better options available at the same price. Uniden is a leading provider of security cameras; the newer camera systems they offer comes with the best of specifications. Customer feedback show the systems are durable. If you have used any of these systems or any of Uniden security cameras, tell us about it in the comment section below. The Guardian UDR780HD sounds good for me, just what I was looking for! I have been on the hunt for a solid indoor/outdoor came for the back of my house. I want to have one inside the back room as well as facing off the back patio. We have been having some issues with some kind of animal and I can’t figure out what it is. The 40 foot night-cam space is plenty as well since I do have some smaller spotlights off the garage. Thanks for these reviews, very helpful! Thanks for these breakdowns. I have been on the fence on which camera to go with for a month now. My wife is getting frustrated with me. I tend to research everything before I buy it and I just wanted to make sure I was getting the best camera for our needs. I will be back in the future if I need any help! I am new to the Uniden brand but a friend of mine was recommending I research on them as they are stellar cameras. I live in a mixed bag area where we do see more crime than we should and I thought getting security cams would be a great way to keep my family safe. Thanks for this. I am going to decide on which camera will work best for my needs. I recently got the ULC58 LightCam and ended up returning it. I had no idea it did not have storage included. That was partially my fault for not reading everything about it. Glad you state that in your review. I am going to try on of these other ones you have recommended. The UDS65 is what I got when I was going camping. We had wifi at the cabin we stayed in and we thought it would be a cool way to watch wild life at night. Needless to say I ended up getting 3 more since then and I use them all around my house. I think that model is one of the better ones out for night vision! These are all great options. I actually found this post a few days ago and researched them myself. I am going to likely get a few different ones and see which I prefer hands on. I love that we have all these options these days but it can be overwhelming. Very glad to see someone putting the work in to help people out when deciding what to buy.